Rummaging in my kitchen cupboards last week, I had a very pleasant surprise – I found a pot of dried morel mushrooms which I’d bought last year and forgotten about. Morels are an utterly delicious mushroom, with a honeycomb-textured cap and a subtle and delicate flavour, much less musky than some other wild mushrooms. They can be very expensive, but it’s worth shopping around: I found mine in a shop in Nice last year, where they were cheaper than they are in the UK. The morel season is short, so you’re most likely to be able to find them dried. (If you see them fresh anywhere, snap them up; a fresh morel is a thing of wonder.) Some people out there take morels very seriously – The Great Morel is just one of a number of websites dedicated to this fabulous little fungus, and is well worth a browse. Soak the dried morels in 100ml of freshly boiled water for half an hour. If you’re lucky enough to get your hands on fresh morels, skip this step, and replace the soaking liquid later in the recipe with chicken stock. (If your morels are not as large as those in the picture above, feel free to use a few more.) Dice the shallots and chop the garlic. Melt the butter and olive oil in a sauté pan, and heat over a medium flame until the butter starts to bubble. Slide the chicken breasts in, skin side down, and cook for about seven minutes, until the skin is golden. Turn the chicken over and add the diced shallots and the garlic to the oil in the pan. Move the shallots and garlic around in the pan with a spatula until the shallots are turning translucent, then add the morels, reserving their soaking liquid, and continue to sauté for two minutes. Pour the mushrooms’ soaking liquid (being careful to avoid any gritty bits at the bottom of the bowl) and the wine around the chicken with five tablespoons of home-made chicken stock. The sauce in the pan should simmer – allow it to bubble down and evaporate until you have less than a third of the volume of liquid that you started with. Stir in the crème fraîche and simmer for another minute. The sauce should be glossy. Add the lemon juice and salt and pepper to taste. Garnish with the chervil and serve with mashed potatoes, which you can use to mop up the gorgeous sauce, and a green vegetable. If you thought the hollandaise sauce recipe from the other day sounded like too much hard work, this asparagus recipe will suit you down to the ground. It’s very quick and easy, and this cooking method makes the most of the tender sweetness of the stems. It also looks posh, so you can serve it up as a starter (or as an accompaniment) to guests and feel smug when they congratulate you on something which, in reality, only took you five minutes to put together. For a starter, look at serving between six and eight stalks of asparagus per person. You can get away with less than this if you’re making it to accompany something else as a main course, but it’s worth making plenty because roast asparagus is downright delicious. Snap the bottoms off the stems of asparagus. They’ll come apart naturally, with a lovely snapping sound, at the point where the woody part (which you don’t want to eat) begins. Arrange them in a single layer in a baking dish. Sprinkle the flaked chilli and lemon zest over the asparagus, and drizzle with the olive oil. Roast the asparagus in the oven for 10-15 minutes until bright green. While the asparagus is roasting, use a potato peeler to shave the parmesan into little pieces. As soon as the asparagus comes out of the oven, scatter over the parmesan, which should soften a little as it meets the hot asparagus. Serve the roast asparagus with crusty bread if you’re eating it as a starter. Isn’t eating at this time of year brilliant? The rhubarb is still sprouting away, and now the asparagus is shooting up as well. If you live in Cambridgeshire, it’s well worth making a trip to Burwash Manor Barns in Barton, just outside Cambridge, where they grow tonnes of the stuff. It’s picked fresh daily and sold on-site at the Larder (a very nice deli), where you’ll find a lady outside trimming the stems of an enormous heap of asparagus fresh from the fields, and packing it in wrappers for sale. If you cook it as soon as you get home so the sugars don’t have a chance to turn into starch, you’ll find it amazingly sweet. Supermarket (and, sadly, market) asparagus is never available this fresh. English asparagus is a real delicacy. Unlike asparagus grown in hotter climates, it pops up out of the ground relatively slowly, allowing the plant to build up a much greater concentration of sugars. Burwash asparagus is available as Class I and Class II (50p cheaper than the Class I this year) – I’d recommend the Class II packs, which taste exactly the same as the Class I asparagus, but contain spears which are a bit bendier than the ruler-straight Class I. (See picture for extent of bendiness.) The thickness of spear you choose is entirely a matter of personal taste, but do make sure that all the asparagus that you steam is the same thickness, or else it won’t cook evenly. Of course, dressing your asparagus with melted butter or just dipping each spear into the yolk of a soft-boiled egg makes for a perfectly delicious starter. That said, dressing them with a hollandaise sauce – essentially just butter and yolks with an acidic spike of reduced vinegar – somehow works out to be about ten times as delicious as either butter or yolk on their own. Hollandaise sauce is a rich emulsification of butter and good vinegar (or lemon juice in some recipes), held together by egg yolks. I always add a little boiling water to loosen the sauce and prevent it from becoming too solid – a very thick hollandaise can be overpoweringly rich. Making hollandaise isn’t as intimidating or difficult as some make out, but it will need your full attention, so you need to make sure the answering machine gets any phone calls and ignore any cries of ‘I can’t find my shoes!’ from the family for the ten minutes or so it takes to make. The quality of your butter is all-important here. I used Bridel from Normandy. Bridel or Beurre d’Isigny is fantastic here because of its rounded and smooth flavour. Make sure the water for steaming the asparagus is ready and boiling on the hob as you make the sauce – you’ll need a couple of spoonfuls of it for the hollandaise. Throw the asparagus into the water and put the lid on as you start to whisk the butter into the hollandaise – it only wants a little cooking, and should be bright green and ready when you finish the sauce. Put the vinegar in a small pan with the peppercorns and bay leaf, and simmer it gently until it has reduced to about a tablespoon-full. Remove from the heat but keep warm. Melt the butter and put it in a warm jug. Place a mixing bowl on top of a saucepan part-filled with water. The water should not touch the bowl. Bring the water to a simmer while beating the egg yolks vigorously with a hand whisk in the bowl. As the bowl warms, you will notice that the yolks start to thicken. Add a tablespoon of the boiling water to the yolks and continue beating until they begin to thicken again. Add another tablespoon and beat until the yolks are thickening once more, then add the vinegar with the bay and peppercorns removed, beating all the time until the sauce starts to thicken up again. Pour the butter into the egg mixture in a very thin stream (as if you were making mayonnaise). Continue to whisk as you pour until all the butter is amalgamated, then remove the bowl from the heat. Taste for saltiness and acidity. If you want a little more bite to the sauce, squeeze in a few drops of lemon juice. Remove the asparagus from its water and serve with the sauce either drizzled over or as a dip. Hollandaise sauce freezes well – when you want to use it, just bring it back to room temperature slowly. I’ve been barbecuing a lot in the last couple of weeks, as the UK has sunburned its way through a heat wave. Recently I’ve been experimenting with old-fashioned barbecue sauce, and I think I’ve finally come up with a pretty much world-beating home-made version. (Of course, any recipe which starts with eight tablespoons of ketchup can barely be called a recipe – but I hope you’ll let me off this time.) This is a great marinade and baste, and is thick enough to stay on the wings as they cook. If you baste well during cooking, it will caramelise into a dense, sticky-crispy layer on the skin, making wings just aching to be torn apart with fingers and popped into your mouth. Combine all the ingredients in a bowl and marinade the chicken wings for about eight hours. (You can cut down on this with a vacuum container like a SealSaver, which is what I did.) Cook on the barbecue (or under the grill indoors if the weather is bad), which should not be blistering hot, for 15 minutes, turning regularly and basting each time you turn with the remaining marinade. A note on the balsamic vinegar: don’t use the best stuff that you keep for salads. A cheaper version will do here. I like Aspall’s balsamic for cooking. Maille also do a very good balsamic vinegar, but I’ve not seen it outside France – if anyone knows of any stockists here, please leave a note in the comments! I noticed last week that although I’ve included roast garlic as an ingredient in a few recipes here (use the search tool at the top right of the page if you want to try some when you’ve made this), I’ve never dedicated a post to it. This needs to be addressed, because roast garlic, slipped out of its skins onto crusty bread and popped straight into the mouth, still warm, is one of those things that tastebuds were invented for. Roast garlic is at its best when you use a bulb of fresh (or ‘green’) garlic – not dried, like the papery garlic you usually buy in the supermarket, but still cream, green and pink, with flexible, cool-feeling skin. Some markets and supermarkets carry it at this time of year and also around October. I’ve seen it in Sainsbury’s, Waitrose and the main market in Cambridge, so with a bit of sniffing around (it is very pungent) you should be able to find some. If it’s out of season, never fear; you can also use a dried bulb, and it will still be very good indeed. If you do use dried garlic, try to find a variety that has big, fat cloves. 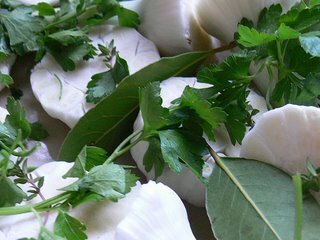 The Really Garlicky Company do a fantastic product, and you can sometimes order fresh garlic from them as well (currently their website says it should be ready in July). As well as mail order, they have a stockists list on the page. Their Patagonian garlic is available in my local Waitrose, and it’s a very superior bulb with huge, juicy cloves which are fragrant and easy to peel. Picking out herbs to cook with the garlic is fun. I’ve used thyme, oregano, parsley, rosemary and bay from the garden, but you’re not limited to these. Sage is also good, and it’s worth experimenting with whatever green herbs you have to hand. The odd chilli tucked between the cloves can also be good. I’ve used butter to lubricate here, but goose or duck fat is also glorious in this dish. If you decide to use some, use 200g duck fat and 200g butter. Slice each bulb of garlic in half across its equator and arrange in a heavy-bottomed roasting tin, tucking the clean spices all around the garlic. Make sure some of the pieces of garlic have their cut sides in the air, and some against the roasting tin, for a lovely variation in texture and stickiness. Dot the butter all over them (I know this is a lot of fat, but you’ll thank me when you taste what’s at the bottom of the dish when you’re done cooking) and drizzle a couple of tablespoons of olive oil over to moisten any non-buttery bits. Sprinkle over salt and pepper. 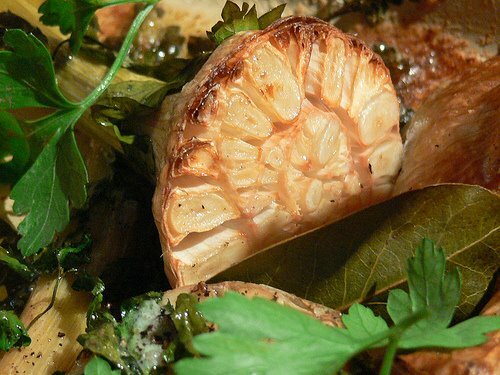 Roast for 40 minutes at 180° C, opening the oven to baste the garlic with the juices three or four times. The house will smell strongly, so open a window. When the garlic is done, the ends of the cloves should be a gorgeous caramel brown. Serve the bulbs up immediately with some really good bread and a little salt for everyone to spike their own garlic with, keeping the cooking dish on the table for dipping in the juices (possibly the most delicious cooking liquid ever). You should be able to pop each clove out of its skin easily, and mash it onto the bread with the ends of a fork. Your daily eating schedule in Helsinki is going to be a bit different from what you’re used to. Here, it’s the norm to eat a simply gargantuan breakfast, then to skip lunch altogether or eat something very, very light in one of the city’s cafés. Most hotels offer a large buffet breakfast. Whenever I’ve been in Helsinki I’ve ended up at one of the Radissons in town. This visit found us at the Radisson SAS Seaside, about ten minutes’ walk from the very centre of town. The hotel is also right next to a tram stop – €2 will buy you an hour’s use of the city’s tram/bus network, and a ticket can be purchased from the driver. This hotel is less seaside than harbourside, but has extremely comfortable memory foam beds, clean laminate flooring in the rooms (marvellous for allergy sufferers) and great black-out curtains. 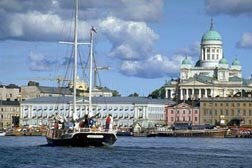 This being Finland, there are also saunas, including two complimentary ones and one on the roof which can be rented by the hour for parties. Radissons always seem to offer great spreads for their buffet breakfasts, and we conscientiously filled up each morning on little sausages with sweet Finnish mustard, bacon, eggs, organic porridge (cloudberry, raspberry and strawberry jams and maple syrup were on hand), smoked salmon, several different crispbreads and rye breads, soused herring, cucumber both fresh and pickled, salads, continental meats, cheeses, yoghurt, muesli, smoothies, juices and vat upon vat of fresh coffee. Coffee is good in this city – there seems to be a degree of national pride in serving a really good cup. 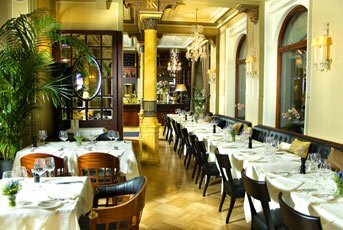 The best I found (unfortunately, it’s priced accordingly) was at Fazer, a café and bakers dating from the 1890s on Kluuvikatu. Fazer is great for the kind of light lunch that is typical here – get food from the counter and pay for it, then sit by the window to watch the crowds go by. We found open sandwiches (be aware that when you order a sandwich in Helsinki, it will be an open one) made from the bakery’s own rye bread topped with concoctions like rare roast beef and tzatziki, or smoked salmon, capers and cream cheese. Pastries here are also a winner – I liked the Bebe, a tiny pink-iced oval of hollow pastry piped full of pureed fresh strawberries and whipped cream. When you’ve finished your meal, head over to the other side of the large room to pick up some chocolates, sweets and baked goods to take home with you. Near Fazer you’ll find Kämp Café at the Kamp Hotel (this is where I’d be staying if I was feeling a bit richer – there’s a library, a glorious sweeping staircase leading up from the lobby and a palpable sense of history). 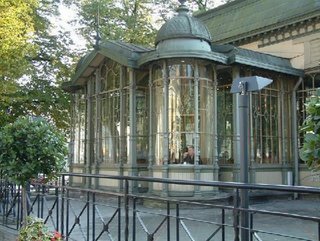 You can sit outside on the Esplanadi in spring and summer – this is one of the nicest spots in the city for people-watching. There’s a thoughtful wine list and excellent raw seafood. We really enjoyed the lime-spiked beef carpaccio, the wild mushroom risotto, a sweetly fresh king prawn and lemon open sandwich and an extraordinarily good club sandwich. Kämp Café is also open in the evenings for supper. Kappeli, at the harbour end of Esplanadi, is worth a visit just for the building. 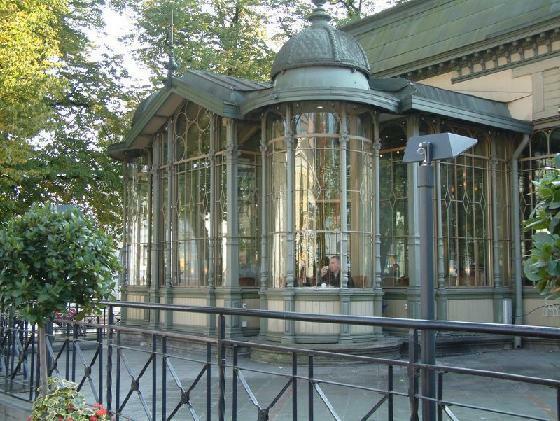 It’s a belle époque glass conservatory, overlooking the sea and Esplanadi’s lovely avenue of trees. Again, the café is self-service. Try the smoked reindeer open sandwich and the excellent coffee. Desserts here are also good. We also ate at Café Ekberg on Bulevardi. Ekberg has been serving pastries, salads and sandwiches since the 1850s – but although there is table service here, we found the service slow and rather rude (astonishing for Finland, where everyone is usually as nice as pie), the food…OK…and the prices rather high for what we were given. We went with friends, and my egg and anchovy open sandwich on rye bread was probably the best of the four lunches ordered (a chicken sandwich was, peculiarly, a sea of superheated Coronation Chicken on a slice of white bread). If you’re an anchovy sort of person, anchovies are usually a good bet in Finland and elsewhere in Scandinavia. They’re unlike the ones you can get in the UK and US. Scandinavian anchovies are sweet and delicately spiced, and match wonderfully with hard boiled eggs and rye bread. Ekberg still wins points with me for the profusion of nice old ladies in hats who shared the dining room with us. I’ll wrap this up now. I am suffering a dreadful craving for coffee. I had a stroke of luck the other day, when I found some baby fennel in the supermarket. 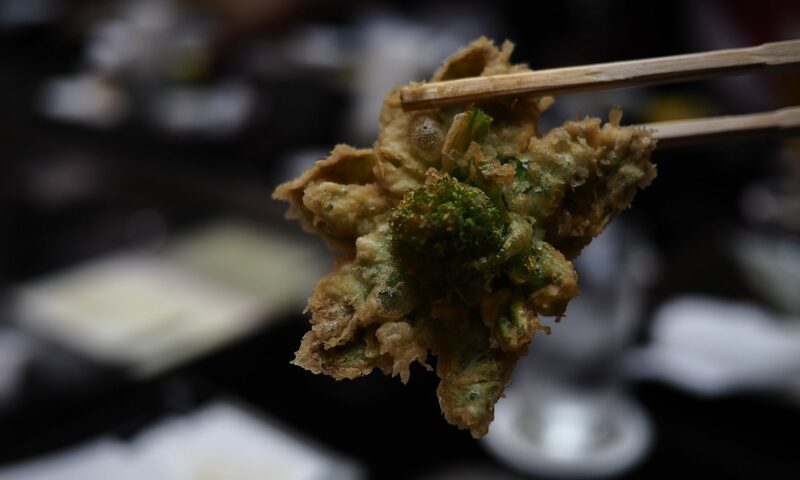 These tiny bulbs with their tender stalks are delicious. They’re a little less strong in flavour than their grown-up cousin, and they’ve got a lovely texture, giving easily to the tooth with a good crunch even after cooking. If you can’t find baby fennel for this recipe, you can use a sliced bulb of the adult version. I’ve teamed the aromatic fennel up with some salty halloumi here, and glazed the lot with a white wine and soft brown sugar reduction. This is a great (and surprisingly quick and easy) supper dish with some crusty bread to mop up the juices. Dice the shallots finely and slice the garlic. Slice the halloumi into pieces about half a centimetre thick. Melt the butter and oil together in a large, non-stick frying pan, and fry the shallots with the fennel seeds for a minute or so until the shallots are becoming soft, then add the garlic, fennel bulbs and cayenne. Cook, turning the fennel, for another two minutes, then add the halloumi to the pan in a single layer with an extra drizzle of oil if you think it needs it. There won’t be much room in there, so put the fennel on top of the pieces of halloumi while the halloumi browns – this will take between five and ten minutes minutes, turning regularly (and carefully – a flexible silicone spatula is really useful here). When the halloumi is golden on both sides, tip in the wine and sugar. Let it bubble up and simmer it hard until the liquid has almost all evaporated. You should be left with a dense syrup coating the fennel and halloumi. Taste to check the seasoning, then serve with a sprinkling of basil (the plant in my kitchen is flowering at the moment, as you’ll see from the photo) with plenty of bread to mop up the aromatic sauce.